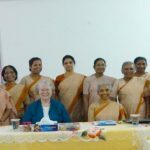 May 16th dawned to witness the wonderful and marvellous deeds our dear good God has done in the lives of our four precious sisters Mary Joysi, Nilima, Seema and Sanjana. The seeds of vocation that were sown in their hearts have grown and formed into beautiful personal gifts totally to be given to God to glorify him and to serve his people. The entire assembly was gathered in our chapel which was decorated very beautifully and artistically. The archbishop of Patna, Rt. Rev. William D, Souza, officiated at the Eucharistic celebration and the vow ceremony. 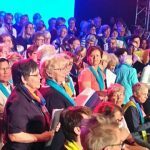 The provincial superior, Sister Mary Tessy, on behalf of the superior general received their vows and accepted them as permanent members of our congregation. The presence of the many priests, sisters, parents and relatives of the sisters making their final profession added much joy. 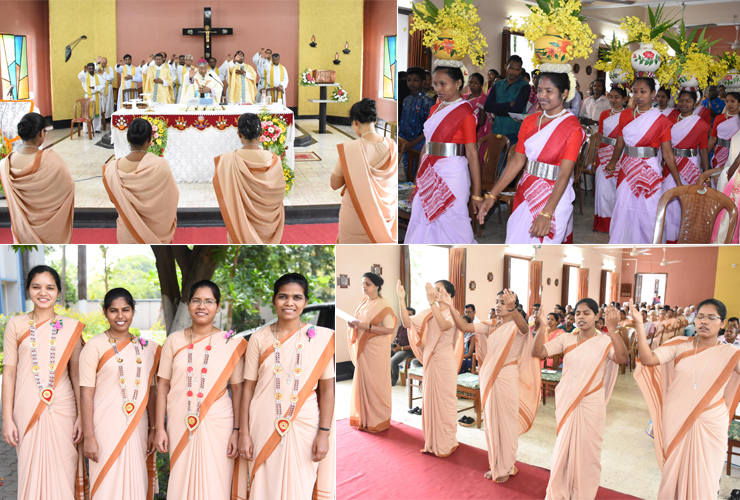 The melodious singing in English, Hindi, Tamil, Sadri and Oraon directed by junior sisters was a marvellous contribution to the solemn and prayerful spirit of the celebration. 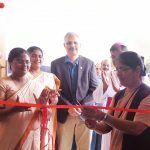 Our Archbishop in his homily inspired and challenged the sisters to deepen their love and commitment to the person of Jesus and to spread the message of compassion and love among his people. 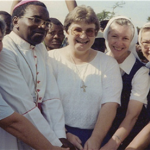 The sisters acknowledged their immense joy and great gratitude to all present – especially their dear parents, relatives, friends, formators and the Sisters of Notre Dame who helped them to become who they are today. Following the Eucharistic celebration was the ceremony of cake cutting. All present enjoyed a delicious breakfast and fellowship. The family members entertained the gathering with songs. The same evening, the newly professed went with their families to continue the celebration in their parishes. God has been great and wonderful in his ways. He has done marvellous things for us. Praise the Lord! The blessing of our Pioneers!